NETWORK FINALS: SUNDAY NIGHT WITH MEGYN KELLY and the rerun of AMERICA’S FUNNIEST HOME VIDEOS gained 0.1 in final numbers. Starz’s POWER rose 0.12 from last week’s holiday weekend airing to 0.76, almost equal to the 0.78 season premiere 2 weeks ago. On Adult Swim, MIKE TYSON MYSTERIES gained 0.07 to 0.57, DECKER: UNSEALED was up 0.09 to 0.36, and APOLLO GAUNTLET was also at 0.36. TNT’s CLAWS dropped 0.05 to 0.41. Showtime’s TWIN PEAKS returned from a 2-week break and its most confounding episode to a 0.5 rise to 0.16, but I’M DYING UP HERE was steady at 0.04/114K (with an episode that had been available for 2 weeks via online/VOD). History’s AMELIA EARHART special rode a tide of news stories to a strong 0.86. 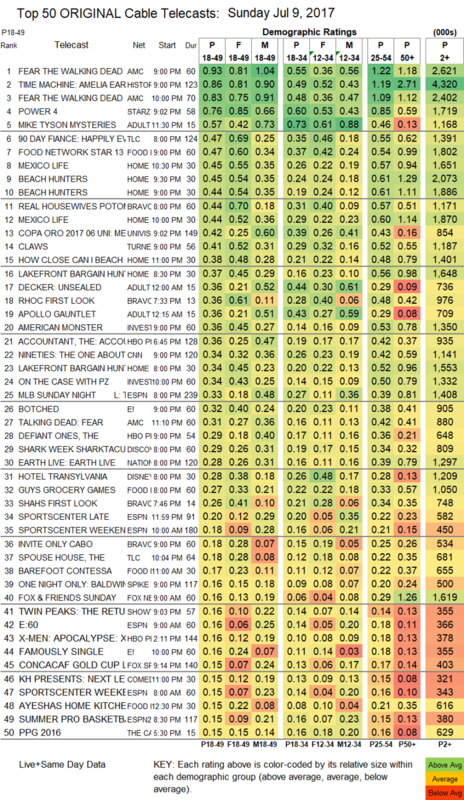 On TLC, 90 DAY FIANCE climbed 0.11 from last week’s holiday weekend airing to 0.47, and SPOUSE HOUSE debuted at 0.18. On Food Network, FOOD NETWORK STAR grew by 0.06 to 0.47, and GUY’S GROCERY GAMES was up 0.05 to 0.27. HGTV’s many Sunday shows were led by MEXICO LIFE at 0.45/0.44 compared to last week’s 0.42/0.39, and BEACH HUNTERS at 0.45/0.44, compared to 0.42/0.38. On Bravo, REAL HOUSEWIVES OF THE POTOMAC rose 0.03 to 0.44, and the season finale of INVITE ONLY CABO was down 0.02 to 0.18. Univision’s COPA ORO soccer match was at 0.42. ID’s AMERICAN MONSTER was at 0.36, and ON THE CASE was up 0.06 to 0.34. 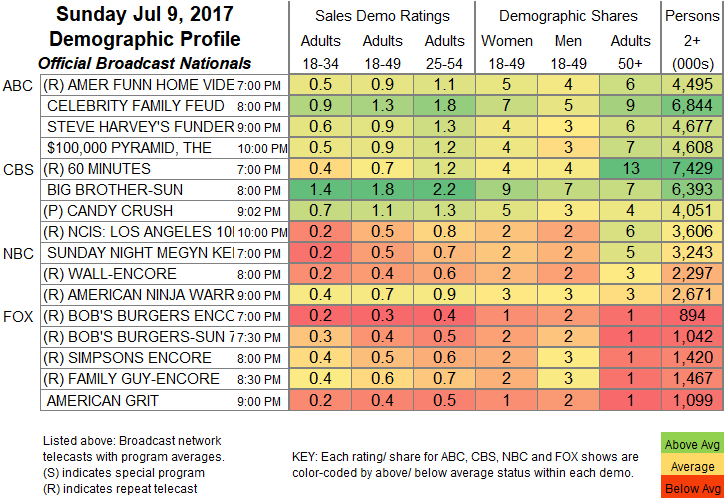 On E!, BOTCHED climbed 0.05 to 0.32, and FAMOUSLY SINGLE ticked up to 0.16. Discovery aired a SHARK WEEK preview show at 0.29.